Click Parameters Manager in the Manage panel. 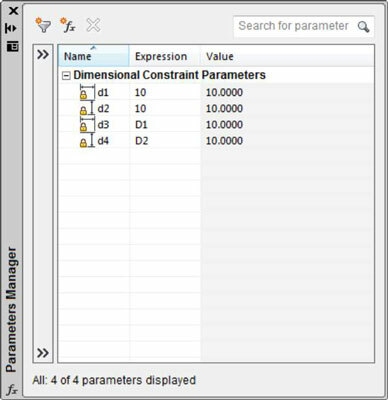 The Parameters Manager palette appears, showing a list of the dimensional constraints applied in the drawing. The Expression column shows the numeric values that you specified for d1 and d2 and the expressions you entered for d3 and d4. The read-only Value column shows the calculated value. You can’t change a value in the Value column (it’s grayed out to remind you). You can only edit the cells in the Expression column. In the d1 row, click in the Expression field to highlight the current value (10, in this example). Then click again and type a new value. For example, type 13 and press Enter. The rectangle resizes itself in the drawing editor, and because the d3 constraint on the top side was made equal to the d1 constraint on the bottom side, both sides change equally. Next, you use an equation as an expression. In the d2 row, click in the Expression field to highlight the current value, and then type an expression. For example, type d1*0.75 and then press Enter. The read-only Value column and the drawing geometry show that the new d1 distance of 13 has been multiplied by 0.75 and is now 9.75. Constrain the circle so that its center is always at dead center in the rectangle, no matter how the rectangle’s size changes. Apply a horizontal dimensional constraint from the upper-left corner of the rectangle to the center of the circle. Locate the dimension, type d3/2, and then press Enter. Because the rectangle is now dimensionally constrained on all four sides, it doesn’t matter which corner you start from. Note that you don’t have to type the whole expression: d5=d3/2. AutoCAD knows what you mean! Repeat Step 5, and this time add a vertical constraint from one corner to the center of the circle. Locate the dimension, and then type d4/2. Who knew that drafting could be such fun? If your drawing becomes overrun with parameters, you can add parameter filters in the Parameters Manager palette. Right-click any parameter and choose Show Filter Tree, or click the double right arrow at the top left of the palette to open the Filters pane. 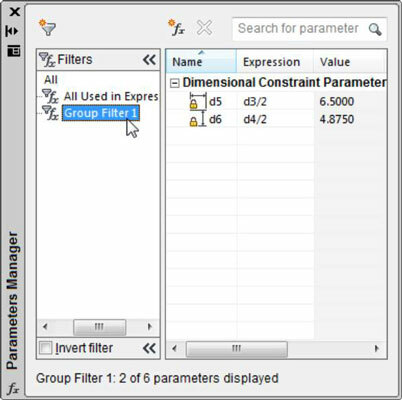 Click the funnel icon on the toolbar to create a new filter group, and then simply drag and drop parameters into the group.